Courtney Cox: A native of Philadelphia, Pennsylvania, Courtney Cox first started playing guitar around the age of 13. When she turned 15, she enrolled at The Paul Green School of Rock Music, and during her tenure there, performed in various U.S. tours with established acts including Jon Anderson and Adrian Belew. Cox continued playing guitar under the tutelage of virtuoso Chris Gordon in Wilmington, Delaware, before eventually moving to Los Angeles, California. In December 2008, Cox was invited to be a guest performer with The Iron Maidens, and soon became an official member of the band. 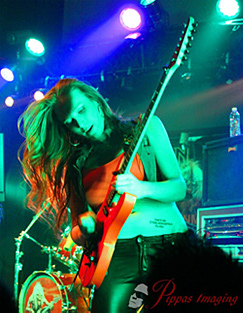 As a member of the Maidens, Cox's stage name is "Adriana Smith", a female version of Iron Maiden guitarist Adrian Smith. A long-time BBE fan, Courtney uses a BBE Boosta Grande™ for every solo she plays, which gives her tone that extra kick to cut across the stage volume of a killer metal band in full tilt. Courtney told us: "I've had BBE pedals on my board since I started playing. They are strong, reliable pedals that truly shape your tone. I know this because they are the secret behind mine." Wanda Ortiz: Wanda Ortiz first learned to play the bass at the age of nine, when the elementary school she attended introduced a music program that allowed students to sign up, and choose an instrument to play. When she arrived late on "instrument day," she wound up with a junior-sized double bass. Lessons on the acoustic instrument followed, but at the same time she taught herself to play electric bass, thanks to a new interest in the school's jazz band. She continued playing bass throughout her school years, eventually earning a degree in music performance from the University of California, Irvine. 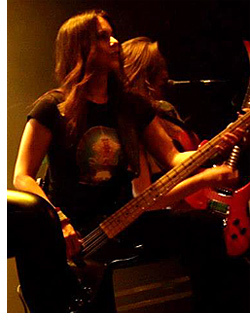 On September 2002, Ortiz joined The Iron Maidens and has remained with the band since. 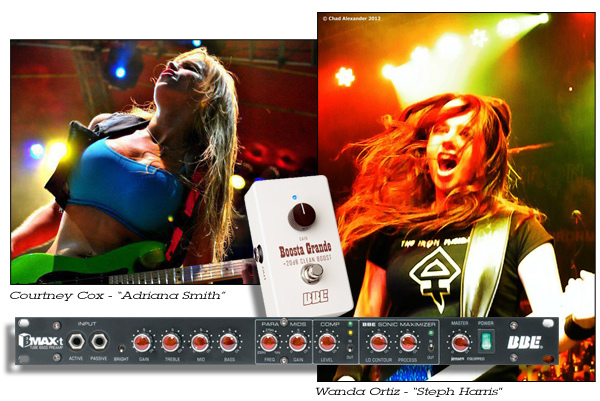 As a member of The Iron Maidens, Ortiz's stage name is "Steph Harris," a female version of Iron Maiden bassist/founder Steve Harris, and powers her G&L SB-2™ sound with the BBE BMAX-T preamp. Wanda told us: "The B-MAX T gives my rig that something extra. It's clean and solid, full and warm, yet punchy at the same time. Perfect." Be sure to catch The Iron Maidens on AXS TV on September 9. The band will be featured on the show "Worlds Greatest Tribute Bands. Check out www.axs.tv for more information. About The BBE Boosta Grande™: The Boosta Grande, a Guitar Player Editor’s Pick, is back in a new compact chassis to conserve space on your pedal board. A clean boost pedal does nothing but pile on gain, right? Well, some do, but that doesn't create the experience players want. You see, added gain will push the amp’s front end tubes harder, creating more of the amp’s own harmonics, but that alone will make the amp seem too bright, sacrificing the tonal balance in the process. You see, we call Boosta Grande a “transparent clean boost” because it doesn't change the tonal balance of the amp, even with Boosta’s max gain of +20dB slamming those tubes. More Info. About The BBE BMAX-T: The BMAX-T is a tube bass preamp/ processor with a class A, DC regulated tube preamp section which follows in the tradition of the classic tube preamp designs of the 50s and 60s. It features a high voltage (300V) tube front end with hand-picked Groove 12AX7 tubes, providing pre-amp gain and passive interactive tone control. More Info.